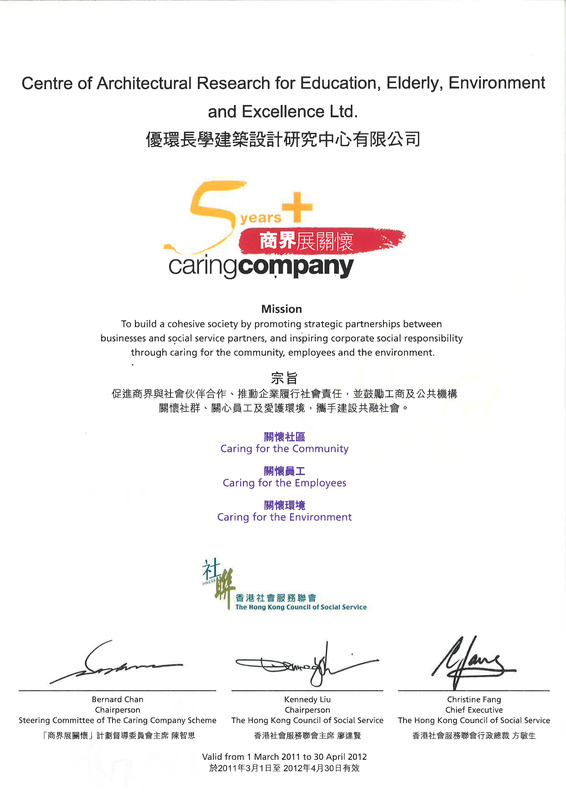 CARE has been awarded the "Caring Company Award" by the Hong Kong Council of Social Service consecutively for 8 years since 2003. This award was a recognition to CARE's community works. With the mission of “we care, excel and innovate”, CARE will continue to be open to and care for the needs of numerous sectors of the community through integration with architecture and architectural professionals. 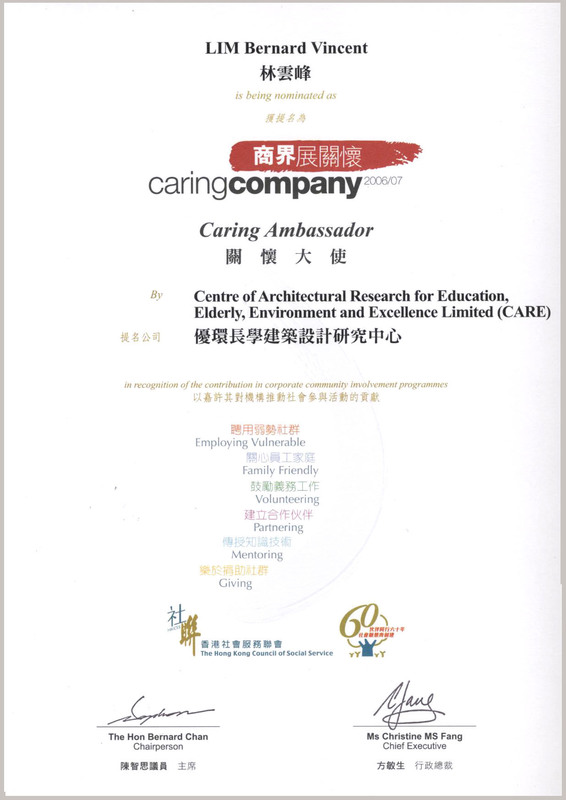 Principal Bernard V. Lim, through the nomination by The Centre of Architectural Research for Education, Elderly, Environment and Excellence Limited (CARE), was awarded the "Caring Ambassador by the Hong Kong Council of Social Service. 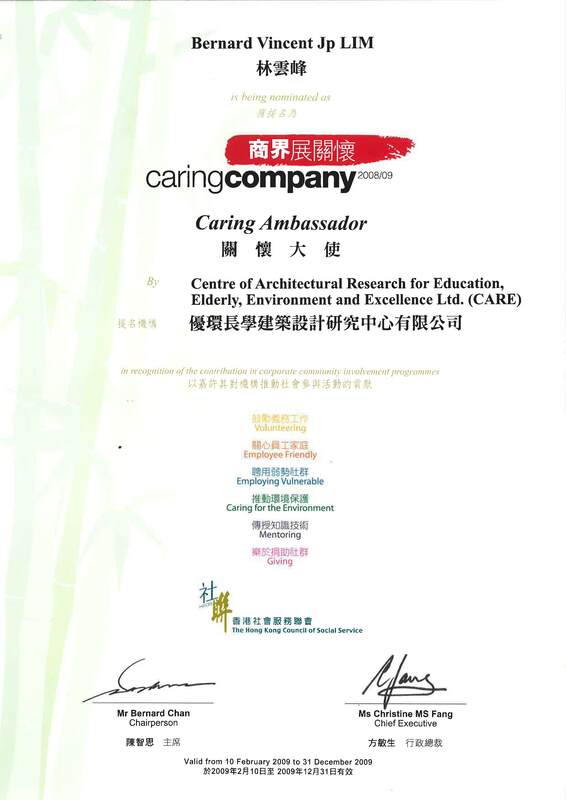 Principal Bernard V. Lim and Mr. Daniel Cheung, through the nomination by The Centre of Architectural Research for Education, Elderly, Environment and Excellence Limited (CARE), was awarded the "Caring Ambassador by the Hong Kong Council of Social Service. The Hong Kong Heritage Awards is jointly presented by the Antiquities Advisory Board and the Antiquities and Monuments Office. It has been established to recognize schools and organizations for significant achievements in heritage conservation and heritage education so as to encourage the community and public involvement in conserving our heritage. "Caring for Our Heritage" Project organized by CARE was awarded merit of the Hong Kong Heritage Awards (2004) - Heritage Education and Publicity Awards (Community Category). About "Hong Kong Heritage Awards "
The Centre of Architectural Research for Education, Elderly, Environment and Excellence Limited (CARE), through the nomination by The Hong Kong Special Schools Council, was awarded the "Caring Company Award 2004/05" and "Caring Company Award 2003/04" by the Hong Kong Council of Social Service. This award was a recognition to CARE's community works.